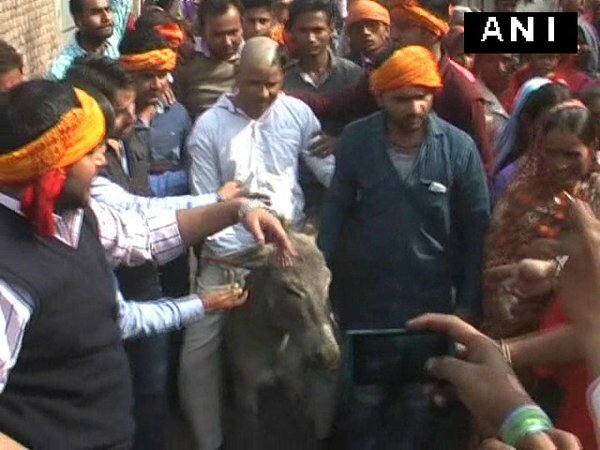 Bajrang Dal shaves man’s head, parade him on donkey. Members of militant Hindu group Bajrang Dal kidnapped and maimed a Christian man in the Indian state of Uttar Pradesh for allegedly converting Hindus to his own faith. The mob shaved off the man’s hair and eyebrows and paraded him through the town. The crowd accused Awdhesh Kumar Savita of luring Hindus on the pretext of attending a satsang, a religious group meeting traditional for Indian religions, where they were allegedly forced to consume beef and made to walk on pictures of Hindu gods and goddesses to prove their conversion to Christianity. The victim of last week’s attack attack was eventually rescued when local police superintendent N. Kolanchi reached the spot of the incident in Jalaun District, Uttar Pradesh. In a statement to local media, Kolanchi said that five assailants were arrested, along with a barber who had been hired to shave Awadhesh’s head. Awadhesh denied that he had forced anyone to convert to Christianity and filed an official complaint against some 25 Bajrang Dal members and 200 unidentified people, who witnessed his torture. “I have been practicing Christianity for the last few years. But I have never insisted on converting anybody,” the 35-year-old was quoted as having told the police. Sangam Jatav, one of the assailants who filed a counter-complaint, alleged that one month ago Awadhesh and some of his friends“promised me a job and financial help if I agreed to meet some of their associates. But on reaching there, they took me to a church and forced me to walk on the posters of Hindu gods and goddesses and eat beef,” the 30-year-old said. He added that there were six persons in the church at that time and they declared that he had been converted to Christianity because he had eaten beef. The police superintendent said that the rest of the group involved in the proceedings “are currently hiding out”while the police are “conducting raids to arrest them.” He also said the police are probing the charges that Awadhesh was forcing conversions. Jalaun District is home to many religious communes, and is sensitive in terms of religion, with even minor incidents apt to spark unrest. There are 41 big temples in Jalaun town, compared to only 33 schools and colleges. The Bajrang Dal group is known for enforcing a program of reconversion to Hinduism in the area.